Past conference sessions are a valuable asset for conference organisers, so for the London’s Calling Salesforce community event I came up with a way to archive them, and now you can too. For the second year I was tasked with maintaining the website for Europe’s largest Salesforce community event – London’s Calling. And running up to the launch of the this years CFP for speakers and sponsorship registration I wanted to leverage the incredible resources that we had in the form of the sessions for the past two years. Seeing that our site was powered by WordPress – using the Tyler conference theme – and that I have released a couple of WordPress plugins before (including the 5* rated Widgets on Pages) I wrote the Past Events Extension plugin to do just what was needed. 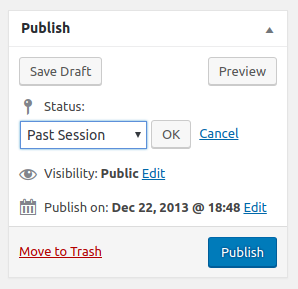 The free version enables site admins to archive sessions, which are then listed on a Past Sessions page. The Pro version includes support for a shortcode that can be used in any page or post to list these archived sessions for a given date range, meaning that you could for example create pages for each past event. The latter is what has been used on the London’s Calling site. Running a not-for-profit event? Get 50% of the annual license now! Additional Video setting – Add embedded video for each past-session (e.g. from Vimeo, YouTube); ideal to show off past presentations. Additional Slide-deck link setting – Add a link to slide-decks used for each session. So what are you waiting for? Go grab the free version now and use your previous events to help sell tickets and gain sponsors. 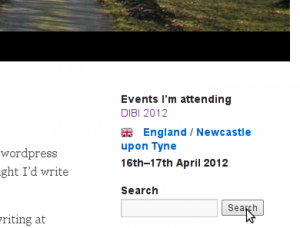 It was 1054 days ago that I first wanted to place a WordPress widget into a post I was writing. 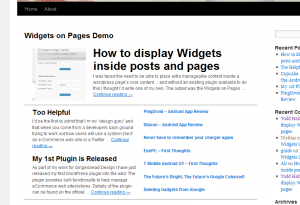 Whether it was for a client site or personal one I can’t remember… the important thing is that out of the solution I came up with emerged the Widgets On Pages WordPress plugin. The plugin has undergone very little change since it’s 0.0.1 check-in to the WordPress.org plugin repository but since then it’s had very favourable reviews and been included in several blog posts and conference talks. But more importantly, for today at least, it’s now been downloaded over 100,000 times! It has a current rating of 4.7/5 and at the time of writing sits as the 105th most highest rated plugin on the WordPress.org repository. 105th might not seem too good but it should be noted there are over 23,800 plugins in the repo. Last night I noticed that the Lanyrd event info that was meant to be listed in my blog sidebar was no longer working. I was, at the time, using the My Lanyrd Widget which was up to a time working well… but then I noticed it had just stopped working. I had a quick browse on the Lanyrd site and noticed that had some official JS and code which could be used to display a badge on your site showing pretty much the same info as the above mentioned widget had been doing. 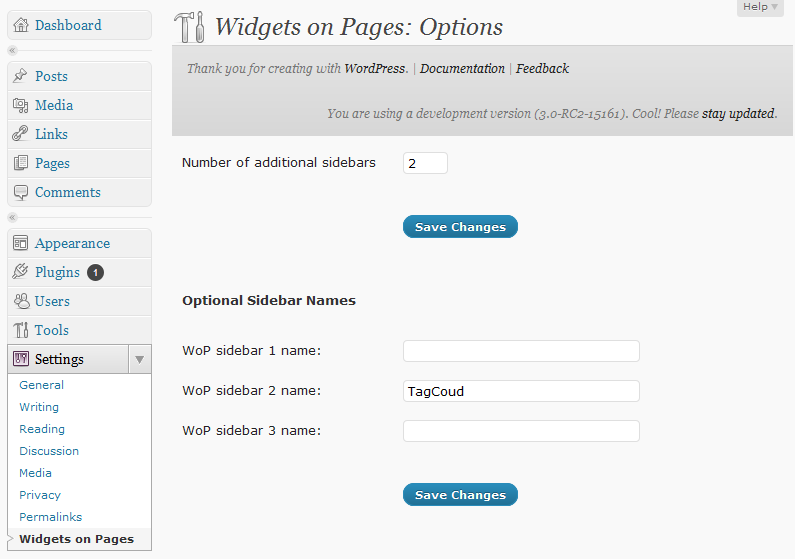 And so, after an hour or so of coding the Lanyrd Splat Widget plugin for WordPress was born. I immediately requested a repo on the WordPress.org site and as soon as this was approved my checked in the code and the Lanyrd Splat Widget was launched! The plugin has settings for the maximum number of events to show as well as the format and of course the Lanyrd username of the info to use. The plugin pulls the info from Lanyrd every time the page is loaded, which is obviously not ideal. I had toyed with the idea of using the ics feed which Lanyrd provides and then using transient storage inside WordPress to temporarily cache the data. I decided to not use this for the time as the route I’ve taken pulls only the data needed and also supports richer data. My view on this may change in time… we will just have to see how this performs. 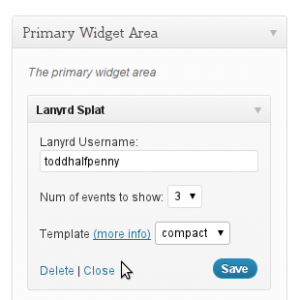 The Lanyrd Splat Widget can be downloaded from the official WordPress.org plugin repository. This latest WordPress 1 Minute Wonder installation covers a couple of quick alternative steps that can be taken to dramatically increase your site performance… and yes I’ll be honest and say that actually to cover all 3 steps here it takes more like 10 minutes. In the below investigation I based “performance” on Google’s PageSpeed rating and Yahoo’s YSlow and this was run against a newly launched online craft store site called Designs and Such. Using the PageSpeed tool (in Chrome) it was possible to see that I had several un-optimised images on my site. I processed these with the free optipng tool and instantly saw an increase in 6 PageSpeed points and 2 YSlow points. Not bad for something which anyone can do. Now there is some stigma around having lots of plugins on your WordPress site and the detrimental affect it can have on performance… now whether you back this line of thought or not* sometimes plugins can really benefit your site in this context. Now please be sure to backup your DB (or entire site) before using any plugins which might modify you’re .htaccess and potentially other files in your installation. Another step, this time plugin-free, should immediately give some good results. Simply by adding the following lines to one of my site’s .htaccess file I saw a further 4 point increase in my PageSpeed score and a 1 point increase in Yahoo’s YSLow rating. This is defining a 1 month expiry for all content covered by the files types listed above. Note if you do this there’ll be implications if you want to modify any of the files, like CSS, and have the changes to affect immediately. So in total by carrying out the above steps I saw the following performance increase. Of course the results will vary site by site but I believe that with Search Engines using site performance as a factor when ranking your site that 10 minutes spent here will be of value. In this edition of WordPress 1 Minute Wonders I will answer a question which I frequently get emailed about… and that is how to style widgets next to each other when using my Widgets on Pages WordPress plugin. 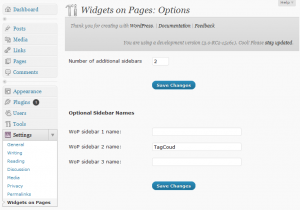 In this post I have 3 widgets in one of the sidebars created by the plugin. I have named the sidebar horiz. To get the Widgets to display as they do above there was some extra CSS that I had to add to my theme’s style.css file to get them to display like this… here it is. In the first section we style the whole sidebar (you would replace .horiz with whatever you had called your sidebar), making sure that the content overflow is set to auto. This makes sure that any content following the sidebar does not also creep up alongside the widgets. The second section styles the widgets (all three in this case). The key part here is the float:left; which makes them site alongside each other. By adding a few lines of code or installing a plugin or two you can add some extra spice to your WordPress blog (or other WordPress powered site) and at the same time bring a lot more value to your readers. Of course these tips are dependant on your ability to install plugins/widgets etc and some are also only applicable to themes with certain functionality, but you should see at least one tip here that you can apply nice and easily. If your blog has a sidebar (and let’s face it most blogging themes proide at least one) then this gives you prime screen real estate to give extra information to your readers about you and your blog or subject matter. There are many, many plugins out there which cater for all sorts of users and content type. As you can see on my sidebar I provide a list of events that I’m attending, giving hopefully some more context to the things that I’m interested in. This is powered by the My Lanyrd Widget and as such pulls information from my Lanyrd account. As I’ve said, there are many sidebar widgets available… so what are you waiting for, go get some! Following on from Step 1 is the perfect tip for adding extra “dynamic” content to otherwise fairly static blog posts or pages… Add your widgets to them! Shortcodes can be extremely powerful and can provide you with a quick way to add extra content/design to your posts and pages. There are many “shortcode” plugins available and a lot can be downloaded for free from WordPress.org. A simple example is the J Shortcodes plugin which among other things enables you to quickly add styled areas to your posts. A key way to give your readers more is to improve the default RSS feed that goes out to them. This is done by adding some short code to the functions.php file (located in your WordPress theme’s directory). I add the featured image to my articles as well as a short finishing line to thanks the reader for the time and to send them to my blog. The options here are really only limited by your imagination, you could add links to related posts for example. $content .= '&lt;p&gt;Thanks for reading, check out &lt;a href="'. With every day that goes by there are more and more Internet-ready devices on the market and these come in all sorts of sizes. And it’s with this in mind that having your blog ready to display optimally on this wide range of fixed and mobile devices you should really start thinking about making your blog “responsive”… or at least mobile phone friendly. There are various free and paid for ways of getting your site to work well for readers who aren’t just using their PC at home or work, but I’m gonna focus on just 2 here. This is the best place for your site to be… it means that your site is future-prrof (ish) for devices of all various sizes to access it. Implementing this generally means having to get a theme tweaked to utilise media queries and various other CSS techniques… but I have a cunning plan for those using the default TwentyTen WordPress theme… the Responsive TwentyTen plugin. This plugin (free) instantly turns your site into a responsive one and means that as the browser window size changes your site re-formats itself to display in the most optimal fashion. Don’t believe me? Just try it on this site. There are several plugin available which will server up optimised content for mobiles. 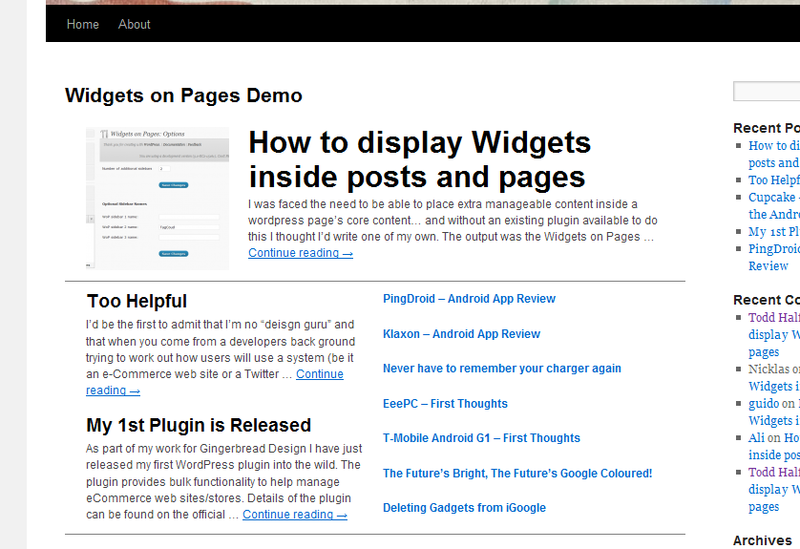 A decent review of different plugins and approaches can be seen over at WP Candy. [jbox color=”blue” vgradient=”#fdfeff|#bae3ff” title=”Get Started”]So what are you waiting for? Styling WordPress page and post layouts can be daunting for the novice… especially if you don’t want to dirty your hands with PHP and the like. I wanted to experiment with what was possible to do using only the default WordPress theme 2010 and plugins alone (OK, some CSS was needed). So I set myself the challenge of mirroring something which is a classic layout across news sites and ended up with the perfect example from the BBC News web pages (please someone let me know if I’m NOT allowed to publish the below pic). 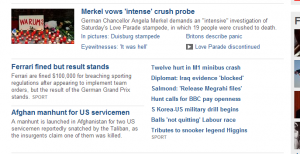 The desired layout is essentially a main news article with a supporting image followed by a couple of secondary articles and then a listing of tertiary articles. My initial ideas came from using the Widgets on Pages WorPress plugin that I had developed which allows the addition of sidebar areas to be inserted inline in pages and posts. Using this plugin I was able to essentially define multiple areas in a standard page (using a standard template) which could then have independant content defined and (with some tweaks to the live version of the Widget on Pages plugin) could be styled each in it’s own way. This, by itself, was limited though as I really needed some mechanism to pull in the desired stories… I needed something to support it. Then at the recent WordCampUK 2010 I was lucky enough to be attending Michael Kimb Jones‘ presentation on WOW Plugins when the Query Posts plugin (by the incredible Justin Tadlock) was brought to my attention. The plugin provides a widget can be set up to be populated with the result of a query against the posts in the database. Kimb actually mentioned that he had thought of producing an entire WordPress site just through widgets… a very similar one to the train of investigation I was pursuing. This Query Posts plugin was the answer. I put this plugin to work (with some slight mods to now use WordPress featured image feature) alongside my own Widgets on Pages plugin and some additional CSS to the 2010 theme to come up with a layout that is indeed on the way to what I was after. To support this I have 2 sidebar areas defined (featured_news and also_in_the_news) which each have Query Posts widgets in which pull in the news feed with each one offset to allow idea of one single feed. I was faced the need to be able to place extra manageable content inside a wordpress page’s core content… and without an existing plugin available to do this I thought I’d write one of my own. The plugin approach allows the user to add a lot of extra control to their wordpress sites without the need for any coding or markup skills (PHP, MySQL, HTML etc). UPDATE: In version 0.0.4 you are able to define an unlimited number of separate sidebars and call these all separately within the wordpress content.